After doing the usual web search with Google and Bing I found only sites claiming doing a scan with Microsoft Security Essentials of a file or directory from the command-line was not possible. Most sites just say it’s possible to initiate a quick or full scan or even update signatures from the command-line. But as Microsoft Security Essentials has real-time protection there is no need to scan manually (as a lot of us are used to) to make sure the file is scanned. But on Windows 7 (x64 version confirmed) the tools in %ProgramFiles%\Microsoft Security Client contain some files that look promising. 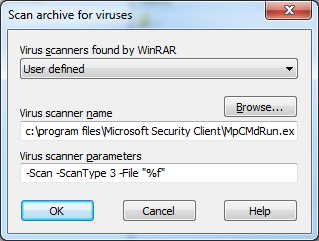 My first guess was to look into %ProgramFiles%\Microsoft Security Client\msseces.exe, but that program only pops-up the user-interface and worse case starts a default scan. Finally I accidently fired up one of the other executables in %ProgramFiles%\Microsoft Security Client with a promising name (MpCmdRun.exe) with a switch –h and voila a long description with the answer tucked inside. Note: although %ProgramFiles% points to c:\program files at both Windows x86 and x64, not all applications will expand it properly to something like c:\program files. Today I had the need to address a C# Component I wrote and that is part of a larger C# UserControl by name (so by a String). I know there are other ways to address components but for some reason I will not explain in this blog post I needed this feature. The main problem is that Components do not have a Name property although in the Visual Studio Property Inspector components do show a ‘(Name)’ property containing the value I was after. I started searching the internet but without luck. Plenty of solutions for Controls but none for Components except for the obvious ‘why do need this anyway’ type of non-solutions and a fair number of unanswered questions. Some months ago I already solved a minor piece of the puzzle by finding a way to get the Component’s Name at Design Time. 2: /// GetName() only works at Design Time. However nice this works on Design-Time, on Run-Time this code fails completely as the ToString() is empty or at best contains the class name of the Component. So how do we get this Design-Time value available at Run-Time? The answer was a specially defined property that behaves differently at Design and Run-Time. 7:         //If at designTime we store GetName into fColumnName. 16:         //If at designTime we store fColumnName and ignore value. Above code will use part of the GetName() method’s code to distinguish between Design-Time (ToString()’s value is a combination of Design-Time name and ClassName separated by a space) and Run-Time where ToString() is just the ClassName. The getter and setters work differently at Design-Time and Run-Time. Both getter and setter set the private storage field ‘fColumnName’ at Design-Time with the value returned by GetName() and the getter off-course returns this value. So on Design-Time the setter totally ignores the ‘value’ parameter passed. On Run-Time the getter does return the private storage field and the setter does set it with value as a normal property would do. Finally, the attributes of the property make sure it is not visible in the property inspector but will be saved into the *.designer.cs file properly. I experimented with the ReadOnly attribute too but that only leads to the form designer not saving the property into the *.designer.cs file. If you remove the ‘Browsable’ attribute or set it to true you can see the ColumnName property at Design-Time. Basically what happens is that the Design-Time value end up in the private storage field of a property that is saved into the *.designer.cs file. At Run-Time GetName() is totally ignored and the value retrieved from the *.designer.cs file is used as if it where a normal property. The result is a property that changes nicely when a Component is renamed and cannot be edited at Design-Time but is serialized into the *.designer.cs file as it should. Note: the code presented in this blog post only works on Components you write yourself and frees you from maintaining a separate Name property that has no actual link to the Components Design-Time name nor will be adjusted when renaming the Component. Maybe someone can bolt it on with an extension method. Generate files for Microsoft’s HtmlHelp Workshop when executed from Visual Studio. Show all kind of context sensitive help when executed outside Visual Studio. During the writing I needed an Enable property visible in the property inspector of Visual Studio that was global to all instances of my component. This code shows a Enabled property in the property inspector, but when the value is of a single component instance is changed, the changed value in all other instances too. Today I wanted to code a submenu with menu items that are checked like a radio button group. So once a single menu item has been checked, there is exactly one item checked all the time. The task proved a bit harder than I expected. The RadioCheck property is no longer present in MenuToolStrip and ToolStripMenuItem as it was in the old MenuItem class. So time to code one! Basically the code below assumes you have a ToolStripMenuItem which contains all ToolStripMenuItems that are part of the radio button group in its DropDownItems collection. Optionally you may check one ToolStripMenuItem as startup. Once a ToolStripMenuItem is checked there is no way to uncheck them all. The event handler code below unchecks all other ToolStripMenuItems in the DropDownItems collection in such way that one does not end up with a stack overflow exception. 2: /// Simulate RadioCheck MenuItems. 11:     //Make sure that one menu item is always checked. 14:         //Uncheck all other menu items. 26:         //bail out to prevent a stack overflow. 35:         //If nothing is checked, check ourselves again. //Make sure that one menu item is always checked. //Uncheck all other menu items. //bail out to prevent a stack overflow. //If nothing is checked, check ourselves again. Heard a nice ‘trick’ some time ago I need to write about (so I do not forget it ;-). I wanted to access a tomcat web application on a server that was mainly running a Drupal CMS. As I do not like shooting holes in firewalls I dislike the use of port 8080 too. The solution I heard was both simple and elegant. Basically one installs and configures a Tomcat server and deploy a web application on this Tomcat server listening top a port that can only be reached on the server itself (8081 in the example below). Then you define a mapping of the tomcat URL to a URL inside the apache servers web space. 8081 is the local port to the Tomcat server, not reachable from the outside. 127.0.0.1 is the local address of the server, not reachable from the outside. OAIHandler is a URL inside the web application that does the work (and I re-used it as URL inside the Drupal webspace). URL parameters are nicely appended. LiLiTarget is the name of the web application inside Tomcat’s ‘webapps’ directory. The name of the web application is not used as part of the URL. Nice side effect of this approach is that you easily swap Tomcat servers or have multiple Tomcat servers running, each with their own port number and each running only a single webapp deployed. This way you can nicely restart/maintain a single Tomcat without affecting the reset of the instances or have multiple Tomcat versions running on a single server. Ever wondered how to get rid of those pesky *.js.php files where you need PHP to write a single variable into a JScript? After a lot of searching I stumbled upon a nice solution (see http://feather.elektrum.org/book/src.html) that allows you to pass query parameters to a script in it the SCRIPT’s tag’s SRC attribute just like normal html pages. The problem inside the script is that there are potentially two sets of query data, one for the script (the one we’re after) and one for the page the script is a part of. This last set is access through the usual window.location object. After which you can simple use it with params[‘course’] or whatever you’re after. Today I solved a problem that hunted me for the last couple of days. When I use Eclipse x64 and startup Tomcat, the Tomcat server runs in 32 bits mode. So I started Googling for answers and found not much more than that it should be supported since version x. No luck thus. Today I took another approach: I uninstalled all 32 bits Java versions and also the x64 JRE so I only had a single x64 JDK left on my machine. This off-course crashes the 32 bits Eclipse version I still have hanging around but that’s another story. Starting Tomcat with this configuration still showed a 32 bits Java version. So I started examining the batch files used for Tomcat startup. There I found a curious setenv.bat containing code to reset the JRE_HOME after probing the bundled Tomcat JRE. The resolution was simple (if the JAVE_HOME environment variable is set correctly to the x64 JDK location), just delete the bundles 32 bits JRE directory and Tomcat will happily start in 64-bits mode. Nice side-effect is that I know only have to update a single Java version and am freed of yet another old bundled version that isn’t automatically updated.